"ILIAKTIDA STUDIO-VILLAS" COMPLEX CONSISTS OF 5 LITTLE HOUSES 40 SQ.METERS. THREE OF THEM ARE APARTMENT TYPE WITH SEPERATE ONE BEDROOM. THE APARTMENT TYPE HAVE A SEPERATE BEDROOM WITH DOUBLE BED FOR THE COUPLE. IN THE LIVING ROOM THERE IS ONE MORE SINGLE BED FOR THE THIRD PERSON OR TWO MORE SINGLE BEDS FOR FOURPERSONS..
TWO OF THEM ARE ONE SPACE STUDIO TYPE. THESE ARE GOOD FOR COUPLES,FRIENDS OR FAMILIES MAXIMUM FOUR PERSONS. ILIAKTIDA STUDIO-VILLAS HAVE FULLY EQUIPPED KITCHEN, AIR CONDITION, SOLAR WATER HEATERS,FREE SATELLITE T.V AND WIRELESS INTERNET. ALL STUDIO-VILLAS ARE BY SIDES OF A PENTAGON (170 SQ. MET) SWIMMING POOL. ILIAKTIDA ACCOMODATION IS LOCATED IN A GREEN ENVIRONMENT DOWN OF THE GREEN “ FANEROMENIS” HILL AND THREE HUNDRED METERS AWAY FROM AGIOS IOANNIS BEACH. NEAR BY THERE ARE THE FAMOUS FOR WIND SURFERS AND KITE SURFERS BEACHES “MILI”. ONE KM AWAY IS “GIRA” “KASTRO” AND “AMOGLOSA” SANDY BEACHES FOR FAMILIES AND CHLDREN. OF COURSE THERE ARE RESTAURANTS AND MANY CAFÉ –BARS AROUND. OUTDOOR AREA IS FULL OF GRASS TREES FLOWERS AND PLAY GROUND FOR THE CHILDREN. BARBEQUE FOR COMMON USE IS LOCATED IN THE COMPLEX AREA . PARKING TOO IS IN THE AREA OF COMPLEX. 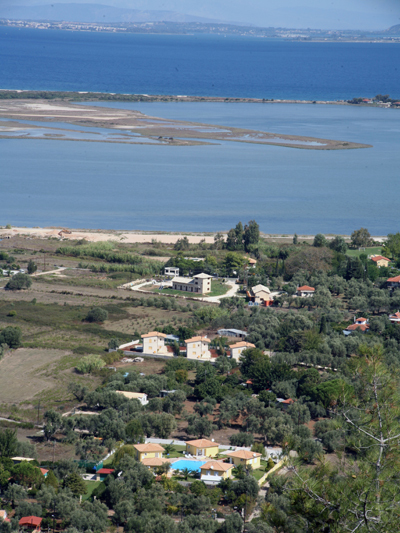 CITY OF LEFKADA IS ONLY 2 KM AWAY. ILIAKTIDA STUDIO-VILLAS ARE PERFECT FOR THOSE WHO WANT TO MAKE QUIET HOLIDAYS OF RELAXATION AND SERENITY IN HAVING THEIR DISPOSAL ALL THE COMFORTS OF A MODERN HOME NOTICE THAT PETS NOT ALLOWED!! !